Infrared thermal imaging is a technique used by some home inspectors during inspections. An infrared camera shows the inspector temperature differences that would not be visible without this tool. These variations in temperature are used by professional inspectors to understand issues going on behind the floor, ceiling, and walls. Not all home inspectors are trained to use thermal imaging in home inspections, but it is always a good idea to work with one who is. A thermal imaging camera is useful for providing insight on issues that would otherwise go unnoticed. Home inspectors who use thermal imaging in home inspections include pictures captured by an infrared camera in the inspection report. The pictures have detailed explanations about what the images mean. The radiation produced is shown in the pictures in a spectrum ranging from light colors to dark colors. An object that appears yellow in color is radiating more thermal energy than an object that appears blue. For example, consider a ceiling that is indicating a darker area on a thermal image. This means that there might be excessive moisture behind the ceiling that needs to be investigated to pinpoint the source. What Can Thermal Imaging In Inspections Detect? 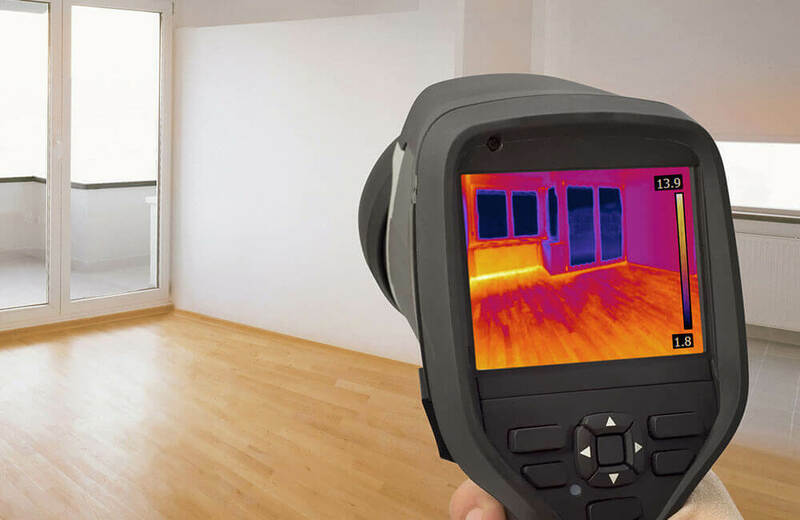 Thermal imaging is used to shed light on a wide array of issues in the home such as electrical hotspots, missing insulation, moisture intrusion, openings that have to be sealed, and areas of heat loss. Electrical hotspots that go unnoticed by the naked eye may be revealed on infrared images. Excess heat emitted from the electrical hotspot appears orange, white, or yellow when viewed through a thermal imaging camera. If your house has electrical hotspots, it is very important to know since it is a dangerous fire risk. Moisture or water intrusion can cause serious damage to your house if left unchecked. Luckily, thermal imaging in home inspections can be used to find the source of the moisture intrusion and other water leaks. This is because moisture leaks appear as unusual cooler spots on the thermal image. If your house has air gaps that are affecting energy efficiency, thermal images can bring this matter to light. The best way to improve energy efficiency in your home is to insulate and seal any gaps. Fortunately, those areas can be found using thermal imaging. Use of thermal imaging cameras is relatively new to the home inspection industry. It is incorrect to assume that all home inspectors are skilled enough to use infrared cameras. Do your research when deciding on a home inspector and ask whether they include thermal images in their inspection reports. For a more thorough home inspection, work with an inspector who uses thermal imaging in home inspections. Diligent Home Inspections includes thermal imaging with every inspection. Contact us to book an appointment in Central Maryland.